In order to meet the demands of the investment community, the asset management industry has to continually evolve. Around the year 2000, the latest phase of this evolution began to take place. During that time, hedge funds started to seriously compete with the traditional asset management industry—especially for institutional assets. Since then, investors have distinguished more carefully between alpha and beta, absolute returns and relative returns, and skill-based strategies and market-based strategies. Author Alexander Ineichen has been on the cutting-edge of the money management industry throughout his entire career. He knows how difficult it is to find alpha in today’s increasingly efficient markets, but he also understands how the current paradigm shift in the field of finance can help you overcome this obstacle. Filled with in-depth insights and expert advice, Asymmetric Returns claims that it is possible for an active investment approach to yield a higher and more sustainable long-term return with lower downside volatility than is obtainable through passive long-only strategies. The term asymmetry refers to most investors preferring positive returns over negative returns, that is, a return distribution skewed to the “upside”. 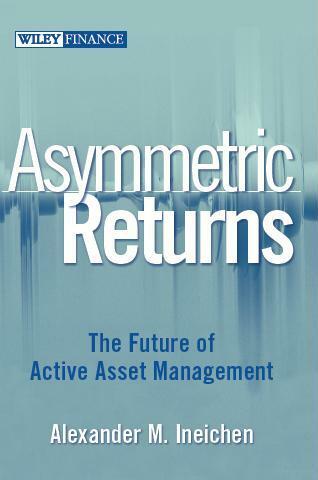 In essence, this book is a manifesto for active asset management. Written in a straightforward and accessible style, this comprehensive guide reveals what it takes to achieve an asymmetric return profile—including an entrepreneurial mindset as well as a dynamic and flexible risk management process that truly corresponds to the end investors’ risk preferences—and outlines the essential elements of this innovative investment approach. The future of active asset management will rely more on finding and exploiting investment opportunities where the risk/reward relationship is asymmetric and less on beating an arbitrary benchmark. With Asymmetric Returns as your guide, you’ll discover how to do this and much more, as you work to achieve sustainable positive absolute returns through an active risk management process. Ineichen is a brilliant thinker and a beautiful writer. The result is this extraordinary book. Asymmetric Returns offers powerful and innovative investment advice in a language every investor can read. What a tempting combination! This book is one temptation you must not resist. Interview in CFA Magazine on Asymmetric Returns. Two page summary of book.